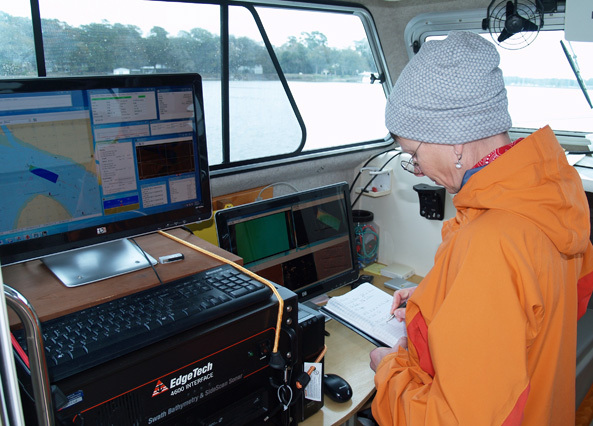 A research team from the University of Georgia Skidaway Institute of Oceanography has completed the first high-resolution, bathymetric (bottom-depth) survey of Wassaw Sound in Chatham County. Led by Skidaway Institute scientist Clark Alexander, the team produced a detailed picture of the bottom of Wassaw Sound, the Wilmington River and other connected waterways. The yearlong project was developed in conjunction with the Georgia Department of Natural Resources. This shows a wide view of the Wassaw Sound survey map. Shallow areas are shown in orange and yellow, deeper areas in green and blue. A second goal was to provide detailed bathymetric data to incorporate into computer models that predict storm surge flooding caused by hurricanes and other major storms. Agencies like the United States Army Corps of Engineers, the Federal Emergency Management Agency and the National Oceanographic and Atmospheric Administration use mathematical models to predict anticipated storm inundation and flooding for specific coastal areas. 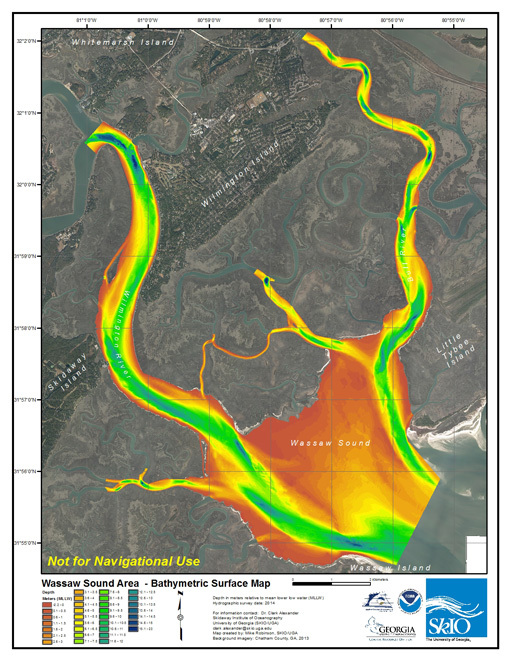 A key factor in an accurate modeling exercise is the bathymetry of the coastal waters. Funded by an $80,000 Coastal Incentive Grant from DNR, Alexander and his research team, consisting of Mike Robinson and Claudia Venherm, used a cutting-edge interferometric side-scan sonar system to collect bathymetry data. The sonar transmitter/receiver was attached to a pole and lowered into the water from Skidaway Institute’s 28-foot Research Vessel Jack Blanton. Unlike a conventional fishfinder, which uses a single pinger to measure depth under a boat, the Edgetech 4600 sonar array uses fan-shaped sonar beams to both determine water depth and bottom reflectivity, which identifies sediment type, rocky outcroppings and bedforms, in a swath across the boat’s direction of travel. The actual process of surveying the sound involved long hours of slowly driving the boat back and forth on long parallel tracks. On each leg, the sonar produced a long, narrow strip indicating the depth and character of the sound bottom. Using high-resolution Global Positioning System data that pinpointed the boat’s exact location, the system assembled the digital strips of data into a complete picture of the survey area. All the other sounds on the Georgia coast were mapped in 1933, but for some reason data from that time period for Wassaw Sound was unavailable. When the team began this project, they believed they were conducting the first survey of the sound. However, just as the researchers were finishing the project, NOAA released data from a 1994 single-beam survey that had been conducted in advance of the 1996 Olympic yachting races that were held in and near Wassaw Sound. Because of advances in technology, the current survey is significantly richer in detail than the one conducted in 1994. “We can zoom down to a square 25 centimeters (less than a foot) on a side and know the bottom depth,” Alexander said. The survey produced a number of findings that were surprising. The intersection of Turner Creek and the Wilmington River is a deep, busy waterway. Although most of the area is deep, the survey revealed several pinnacles sticking up 20 feet off the bottom. “They are round and somewhat flat, almost like underwater mesas,” Alexander said. The researchers determined that the deepest place mapped in the study area was a very steep-sided hole, 23 meters deep, in the Half Moon River where it is joined by a smaller tidal creek. They also found several sunken barges and other vessels. The survey data set is available to the public on the Georgia Coastal Hazards Portal at http://gchp.skio.usg.edu/. Alexander warns that while boaters should find the survey interesting, the information is intended for habitat research and storm surge modeling, not for navigation. “Because the bottom of Wassaw Sound is always shifting and changing, as our survey showed, don’t rely on the data for safe navigation,” he cautioned. Alexander has already received a grant for an additional survey, this time of Ossabaw Sound, the next sound south of Wassaw Sound. He expects work to begin on that survey in early 2015. The Skidaway Institute of Oceanography is a research unit of the University of Georgia located on Skidaway Island near Savannah. The mission of the institute is to provide the state of Georgia with a nationally and internationally recognized center of excellence in marine science through research and education. University of Georgia Skidaway Institute of Oceanography scientist Catherine Edwards is part of a research team that has received an $18.8 million grant to continue studies of natural oil seeps and track the impacts of the BP/Deepwater Horizon oil spill in the Gulf of Mexico ecosystem. Known as ECOGIG-2 or “Ecosystem Impacts of Oil and Gas Inputs to the Gulf,” the project is a collaborative, multi-institutional effort involving biological, chemical, geological and chemical oceanographers led by the University of Georgia’s Samantha Joye. The research team has worked in the Gulf since the weeks following the 2010 Macondo well blowout. The three-year, $18.8 million ECOGIG-2 program was funded by the Gulf of Mexico Research Initiative, or GoMRI. 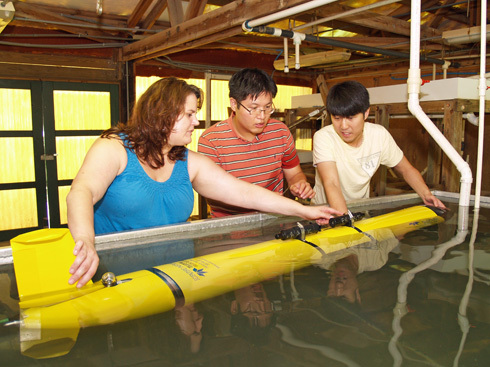 Skidaway Institute scientist Catherine Edwards adjusts a glider’s buoyancy with graduate students Sungjin Cho and Dongsik Chan. Edwards’ role in the project is to use autonomous underwater vehicles, also called “gliders,” to collect data on conditions around the spill site. Equipped with sensors to measure characteristics such as depth, water temperature, salinity and density, the gliders can cruise the submarine environment for weeks at a time, collecting data and transmitting it back to a ship or a shore station. The gliders will operate both in conjunction with shipboard instruments and also independently. One advantage of using the gliders is they can operate during storms and rough weather, when it may not be possible to use ships. Edwards said shipboard work doesn’t always give a full picture of ocean dynamics simply by the fact that they can only go out when the weather is reasonably clear. When working in conjunction with research ships, the gliders can provide additional observations, significantly improving the quality of the data set. The gliders also report dissolved oxygen concentrations and optical measurements of chlorophyll and organic matter, and may also be used as a test vehicle for new instruments in development. Edwards will use “GENIoS,” a new software package, to help navigate the gliders. GENIoS uses high-resolution forecast models of wind and ocean currents, along with information from the glider itself, to calculate the optimal path for the gliders. This will improve the quality of the scientific data collected. GENIoS is a collaboration among Edwards, Fumin Zhang from the Georgia Institute of Technology and their two Georgia Tech Ph.D. students, Dongsik Chang and Sungjin Cho. GENIos has been tested for more than 210 glider-days on the continental shelf off Georgia and South Carolina. This experiment will be its first test in the Gulf of Mexico. Edwards also hopes to use this project to test the gliders as platforms for new, experimental sensors developed by other members of the ECOGIG-2 team. Others involved in ECOGIG-2 include UGA marine sciences faculty Christof Meile, Renato Castelao and Catherine Edwards as well as Annalisa Bracco and Joe Montoya of Georgia Tech. For additional information, contact Catherine Edwards at (912) 598-2471 or catherine.edwards@skio.uga.edu. Educators and scientists from the University of Georgia Skidaway Institute of Oceanography and the UGA Marine Extension Service have developed a novel education program based on ocean robots to spark an interest in science and mathematics in middle and high school students. The team invented a board game that lets students explore different strategies for navigating autonomous underwater vehicles, called AUVs or gliders, through the ocean. The program, “Choose Your Own Adventure,” capitalizes on Skidaway Institute’s expertise with AUVs and MAREX’s extensive history of marine education. Skidaway Institute scientist and UGA faculty member Catherine Edwards and MAREX faculty members Mary Sweeney-Reeves and Mare Timmons are directing the one-year project, which demonstrates the decision-making process in “driving” gliders. Gliders are untethered, torpedo-shaped vehicles that are launched into the ocean to collect data as they move through the water. They glide up and down by adjusting their buoyancy and pitch. Gliders can remain on a mission for weeks at a time, equipped with sensors and recorders to collect observations of temperature, salinity, dissolved oxygen, and other biological and physical conditions, even under the roughest weather. Every four to six hours over their mission, they surface and connect to servers on land to report their position and vehicle and mission information. They also can send data back to shore or receive new instructions from pilots anywhere in the world. Skidaway Institute’s glider, nicknamed “Modena,” has been used in several recent projects, including “Gliderpalooza,” a simultaneous, cooperative launch of dozens of AUVs from different institutions in 2013 and again in 2014. Skidaway Institute scientist Catherine Edwards and MAREX faculty member Mare Timmons (far right) cheer on a small child who tried her hand at the “Choose Your Own Adventure” game at Skidaway Marine Science Day on Oct. 25. The AUV activity/game is a part of an outreach program targeting mostly middle school students and it highlights the problem of working with the strong tides that are characteristic of the Georgia coast. A big issue in operating gliders is developing a guidance and navigation system that will function well in strong currents. The fast-moving Gulf Stream, located roughly 100 miles off the Georgia beaches, also introduces navigation problems. On the education side, the predictability of tides makes the proposed program highly intuitive and education-friendly. The activity/game incorporates student role-playing as an AUV maneuvers through a playing field of vector currents on a game board. The student decides how many of his or her moves to spend fighting the current and how many to spend moving toward the finish line. Successful arrival at the destination depends on how the individual pilot responds to currents en route. Activities depend on grade level, so middle school students have different objectives than those in high school. However, all the activities address the direction and speed the AUV travels to a destination. The AUV direction and speed will depend on the sea state, such as strong currents, storms or high winds. Teachers April Meeks and Ben Wells from Oglethorpe Academy have offered their classes as a test-bed for the game. The two have worked closely with the team to integrate classroom concepts into the game and guide discussions about strategy based on the math. Since the activities are multidisciplinary, the teachers’ expertise in building a math curriculum has been valuable as the team integrates concepts of marine science, math and engineering into classroom activities. Rolling giant dice is a fun activity that attracts the students—everyone wants to roll the dice. So far, the feedback has been very positive. “The students really seem to love it,” Sweeney-Reeves said. “More importantly, they are making the connection between the game and science, and learning. 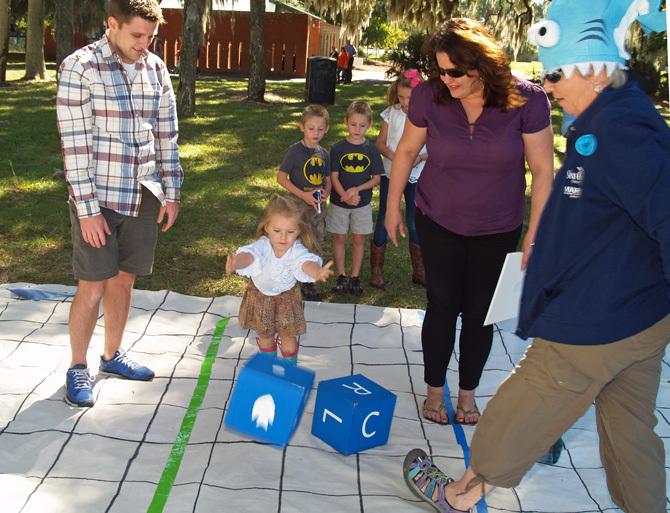 The team demonstrated the game at the campus’s annual open house, Skidaway Marine Science Day, in late October, with a life-sized version of the board game with giant dice. Over 120 students played the game, racing against each other as they explored different strategies to win in three- to five-person heats. Sweeney-Reeves and Timmons also rolled out the game for educators at the Georgia Association of Marine Educators annual conference on Tybee Island earlier this month. Timmons and Sweeney-Reeves think the game has real-life applications and hope the students can use the concepts they learn in the classroom for swimming in our own local waters. The next step is to expand the classroom demonstrations to Coastal Middle School in Chatham County and Richmond Hill Middle School. The activities allow students to develop analytical skills in a program that will be compliant with Next Generation Science Standards for the 21st Century in the common core state curriculum. The program is being funded through a joint grant from Skidaway Institute, UGA Office of Public Service and Outreach, and the UGA President’s Venture Fund. The UGA President’s Venture Fund is intended to assist with significant funding challenges or opportunities. The fund also supports small programs and projects in amounts typically ranging from $500 to $5,000. The Skidaway Institute of Oceanography is a research unit of the University of Georgia located on Skidaway Island. Its mission is to provide a nationally and internationally recognized center of excellence in marine science through research and education. The UGA Marine Extension Service is a unit of the Office of Public Service and Outreach. For additional information, contact Catherine Edwards at 912-598-2471 or catherine.edwards@skio.uga.edu; Mary Sweeney-Reeves at 912-598-2350 or msweeney@uga.edu; or Maryellen Timmons at 912-598-2353 or mare@uga.edu.